Whether you are a Japanese or a foreigner visiting Nara, there are a few exquisite experiences the place can provide, and that only locals- or people who have been living there for a long time- know about. So, here is a list of what Nara can offer you, in aleatory order. Make sure you manage to do as many as possible. They are everywhere in Nara, they are cute and they would eat almost anything. They are probably as popular as the shrines and temples of the old capital, and good reason enough for thousands of tourists to visit Nara every year. They are the deers of Nara, shika, and they know how famous they are. They nod to you as a way to say hello, reach to you for food and then pose graciously for a photo. For them there is a whole range of food stalls with their favorite crackers, shika senbei. You can buy 10 pieces for 100 yen(1 USD) but beware, because once you feed one, you will get the whole heard on your trail asking for more…. And stopping only after they ravaged your bag and your pockets in search for some snacks. Don’t get me wrong, they’re not purposely violent. Just hungry and needy for attention. So challenge no 1 while in Nara: feed a deer! Compared to the previous one, this will be a lot trickier. First of all, you need to know Nara is known for its delicious rice dumplings, mochi, sold on the street corner in a food stal. The name of the street is Mochi Idono (餅飯殿) Dori street and is actually at the entrance of the shopping area of Nara. Don’t worry if you’re not good at finding places. You won’t miss it. The mochi makers are shouting very loudly while pounding the dumplings. It’s a rule, passed on from generation to generation, but also a way of coordinating with your partner. Mochitsuki is a team work, one person pounding the rice with a wooden mallet, the other turning and wetting the rice. It’s perfectly timed and rithmical so even if you don’t get a chance to try it yourself, it’s tons of fun to watch. When you think Nara you think Wakakusa yama, a mountain(more like a hill though) famous in the whole prefecture thanks to some literary works(among which is Tanizaki Junichiro’s Manji) that brought it up. However, Kasuga yama, the mountain on which Kasuga Taisha, the huge shrine, is built, is much more impressive. If you manage to get through the luxuriant vegetations up to the top, you will have the view of your life. And if you’re brave(and crazy) enough ,you can do it just before sunset. Just note that the way back is pitch dark as Japanese sunsets fall faster than you might think, and the road back is the same narrow one through the trees and bushes. A real challenge but totally worth it! 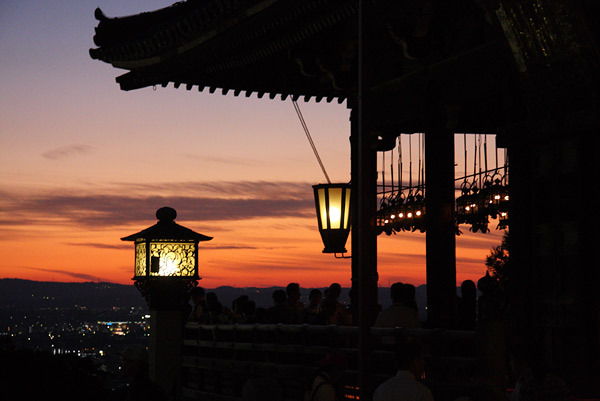 Speaking about places to visit at night, Todaiji is one of them. The twilight chases away the heard of tourists and if you go around 9 PM or later you will find yourself in a place full of magic. The lights cast upon the main gate, the silence and the emptiness of the place provide a creepy yet enchanted-like atmosphere. If you want to see another unique scenery just climb the steps to Nigatsudo the second main temple of Todaiji. If you’re lucky you might just find a friendly monk who will treat you with some good sake and a nice story about the place. 2 stations away from Nara on Kintetsu line, there’s Yamato Saidaiji, the stop for Heijo-kyo, the old imperial palace. Although not preserved in the initial form(it underwent rebuilding and reconstruction works several times) the place is amazing with its size and atmosphere. Every year, from 3-5 May(coinciding with the Children’s day or boys’ day) the palace holds one of the most colorful and lively festivals in Japan – Tenpyo-sai(天平祭). You can admire the parades of people dressed as nobility and soldiers of 8th century Nara, listen to traditional Japanese music in a huge scale live concert, featuring wadaiko (Japanese drums) performances, dancing, and nearly free food everywhere. Best part: for only 600 yen(around 6 USD) you can get dressed up like a princess from Nara period. The outfit somewhat resembles Korean traditional clothes, rather than the ever-popular kimono and yet it has that Japanese something about it, that helps you differentiate it at a glance. Not the most famous festival in Nara but definitely a must go. Every year, on the 17th of December, the shrine Kasuga Taisha holds the Wakamiya on matsuri over a span of few days in a row. The festival peak is on December 17th midnight, when people line up in the main alley of Kasuga shrine, all the way to Nara park. They are waiting in silence for the beginning of procession which will culminate with the apparition of Wakamiya-sama, the main god worshiped at Kasuga Shrine. No one utters a word, all phones and devices have to be turned off. You are waiting in silence, cold and darkness, in line with people you don’t know. The forest rumbles from time to time and even though you’re not allowed to move, you feel a shiver running down your spine and wish you could go back home… The procession starts at the main torii gate of the shrine. The priests are wearing hoods and carrying torches, singing a chant made of almost unintelligible words. Wakamiya-sama makes his entrance in the form of a deer. Unexpected fact for someone who attends the procession for the first time. Also, quite difficult to catch more than a glimpse of the “godly” deer. As the convoy approaches, the wind rustle intensifies, weird animal sounds rise from the depth of the forest. Your fingers are numb with the cold, you’re staring fascinated(almost paralyzed though) at the procession and trying hardly to understand the feeling you’re getting: a mixture of awe, fear and rapture. The festival continues way longer after midnight, until midday the following day. However, as powerful and enthralling the festivities might be during the day, there is nothing that compares to the atmosphere during the night. Whether you are a shinto believer or not, a tourist or a local, whether you believe in any kind of supernatural entity or not, the atmosphere at Kasuga Taisha on December 17th is magic. Extremely creepy, yes, horror-movie like, yes, at times, but definitely magic. Definitely a must go, but don’t forget to bundle up. Nara after midnight is chilly and the fact that you are not moving makes the cold even worse. It’s impossible to miss Sento-kun anywhere you go in Nara. The town’s mascot is present on posters, in souvenir shops, in front of most tourist attractions and sometimes walking around and greeting people. Some call it cute, some weird, but it’s no doubt that the Nara mascot is maybe as popular as the deers I spoke about in the beginning of the article. Sento-kun ‘s name comes from the word 遷都 sento which literally means capital relocation, and refers to the events of 710 AD, when the capital was moved to Heijoukyou palace( yes the one above at number 5). Sento kun is actually wearing Buddhist clothes in the 8th century fashion, and has two cute(?) deer horns on the top if his bald head. After the 1300 years commemoration of the capital relocation, Sento kun has become so popular(inside and outside Nara prefecture) that you cannot possibly go to Nara and not take a picture of (or with) him. The list above is something you can’t find in the usual guide books about Nara. Take up as many challenges of the above and feel the true experience of the old imperial capital. A Short Nara Guide for Your Next Vacation!